No Audrey Hepburn look is complete without cascading white pearls on a black sleeveless minidress. We've noted pearls on almost any possible jewellery piece she's posed with: necklaces, hair pieces, hats. We have pearls at heart too! In our Bella Brilla Lookbook you'll find pearls on items such as elegant bridal purses and the exquisite leggings by our own Scottish designers. Check out the fabulous PEARL Stockings (£85.00) handmade in Scotland with a natural lace heart, light peach cut-lead crystals and Swarovski pearls, a small ivory beaded heart and ivory tassels. The cornerstone of any well-deliberated outerware, a khaki gabardine trenchcoat is an instrument of chic at its finest! 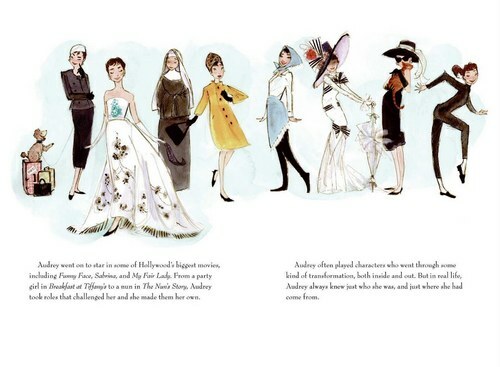 In Audrey's fashion fairytale, hats and earrings go together and go flawless. Don't miss out on this striking ensemble if you want to dress to impress. Whether it is 'Sabrina' necklines (named after her character) and black dresses, Oxford shirts, gingham crop pants, slim black turtlenecks or tailored sailor shirts, she is undeniably one of the greatest style icons ever to grace the silver screen. Check out our blog for exciting news and other bridal articles!